Oregon’s sorrow and wrath from the Eagle Creek Fire should be put towards policy. Griffin Hagle is a contributor to Writers on the Range, the opinion service of High Country News. A writer and energy professional, he grew up in southwestern Oregon and now writes from Utqiaġvik, Alaska. 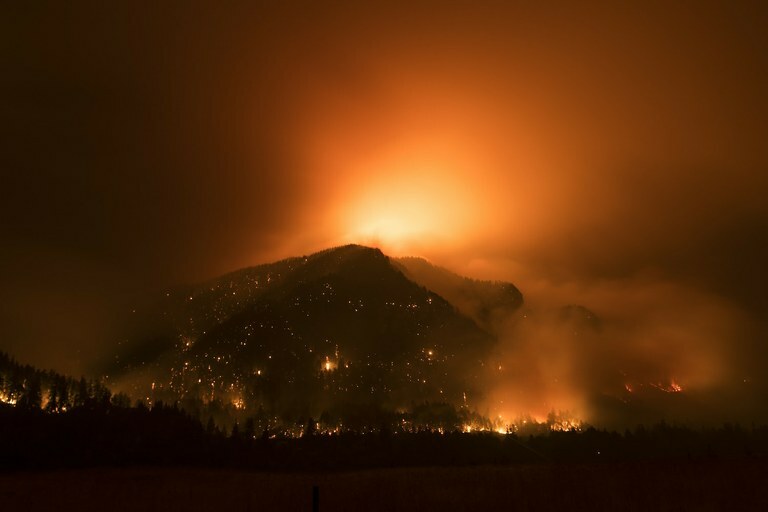 The fire in early fall that barreled down the Columbia River Gorge along Oregon’s border with Washington — reportedly sparked by a 15-year-old’s irresponsible use of fireworks — was notable for its heart-wrenching pointlessness as well as the resulting scenes of apocalyptic terror in one of the Northwest’s most beloved natural settings. Flames nearly engulfed Multnomah Falls, the tallest waterfall in Oregon, and forced hundreds of people from their homes as Portland, 30 miles downwind, woke to a rain of ash from parched skies. From afar, I joined astonished friends and family in mourning this cherished stretch of my native home. “Next time you're thinking about shooting off some fireworks — don’t,” is how my Portland-based friend Ryan Oliver captioned a shared photo of flames racing up a timbered ridge. The Oregonian sampled the wider outpouring of grief on social media. “This is so incredibly unreal. My heart is on the ground,” wrote BJ Thomas of Bend, Oregon. “I am sickened by what is happening in what I believe is the most beautiful 20 miles of landscape in the Pacific Northwest,” wrote Rich Cower. There have been — and currently are — bigger fires across the West, but the damage sustained along the nation’s fourth-largest watercourse will haunt memories for a long time to come. No, global warming didn’t commit the arson in Oregon, just as it didn’t single-handedly swamp Houston, push San Francisco into a record 106-degree high, or blanket much of the West Coast under smoky haze. But it did — and continues to — feed the conditions in which such events are likely to occur. The Eagle Creek Fire in the Columbia River Gorge is expected to be contained at the end of September. For three years in a row, millennials surveyed by the World Economic Forum have called climate change the most serious issue affecting today’s world. Defense Secretary Jim Mattis considers it a “driver of instability.” On the growing “eco-right,” groups like RepublicEn urge conservatives to tackle climate change; some even see President Donald Trump as a potential dark-horse climate champion, à la Nixon going to China. Earlier this year, a group of respected Republican statesmen laid out an earnest proposal for a carbon tax. In fact, despite a loud chorus of know-nothings, a cross-section of concerned, reasonable citizens has clearly concluded that America’s disengagement from crafting solutions is like fooling around with fireworks in a tinderbox of global dimensions. This is where Oregon’s sorrow and wrath are both prophetic and instructive. They hint at the losses our children will bear if we fail to arrest an administration now careening toward ecological disaster. It’s the exact response each of us, no matter our politics, ought to muster every time our leaders shirk their duty to confront this existential threat with the utmost resolve. To be sure, the divisions between ordinary people can make self-destruction seem more probable in the short term than meaningful action. But as legions of rescuers have shown us again and again, there’s no time for dogma when staring down certain death. The response to climate change is a similar all-hands effort. It demands grit and imagination beyond what any singular individual, method, scheme or ideology can contain. There’s room for citizens and scientists, industrialists and activists, globalists and nationalists — and yes, even a certain bombastic head of state. Imagine, for a moment, that the energy we saw in the president’s response to North Korea was used to rally a worldwide partnership to tackle the climate crisis — that would be, truly, a deal for the ages. (I’m afraid we already have enough “fire and fury” raining down on the West right now.) As this response would amount to the largest army ever marshaled, it would also be the closest thing to a just war ever fought: a chance to manage a transition from the fuels that launched modern civilization to those that will sustain it as equitably and peaceably as possible. Forfeiting this chance to act, on the other hand, is unforgivable. It would strip the world of untold beauty and value. The best way to memorialize the losses in Oregon and beyond, and the still greater losses to come, is to channel our outrage until the call for climate action is heard and acted upon at the highest levels of power.